Published September 13, 2013 By Anna T. This post may contain affiliate links. Regardless, I only recommend sites I've researched and/or used and trust. Today, we're talking about Sykes work from home jobs. 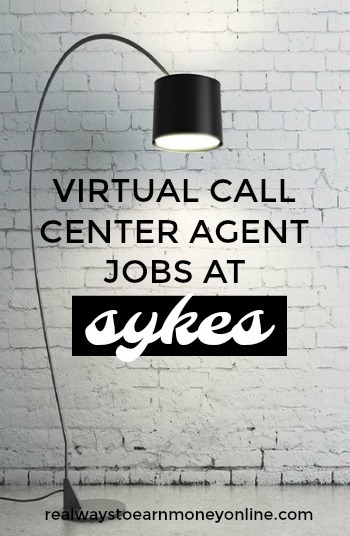 Sykes is a well-known company that hires people as employees to work remotely taking inbound calls for their clients. The Sykes jobs are almost always available to apply for, and they currently hire people living in forty US states and eight Canadian provinces. If you are hired by Skyes, you'll be answering incoming calls from home. The nature of the calls will vary depending on the client (Sykes handles calls for many different companies), but most of the time people will be trying to order items, inquire about past orders, or ask questions about products/services. Your exact rate of pay will vary depending on the client, Glassdoor shows that most people doing the work from home customer service jobs for Sykes earn $9 to $10 hourly. You may also be eligible for sales incentives on sales calls. Pay is made every two weeks via direct deposit to your bank account or bank card. The Sykes job postings on the site now do not show the exact equipment you'll need, but past postings indicated that a Windows-based computer, high-speed internet, a corded land line phone, and both a USB and telephone headset are necessary. The USB headset is for training and the telephone headset is for you to use once you start actually working and taking live calls. Sykes does not provide any of this equipment for you. I have a list of quality work from home headsets if you'd like some ideas on what type to get. Like most work at home phone jobs, Sykes does not permit any background noise when you're working. So make sure you're able to work in a quiet environment if you do get the job. If you're looking for a flexible work at home job, this isn't really going to be it. You agree to a fixed schedule upon being offered a job, although there may occasionally be some clients that can offer more flexible hours. Sykes requires you work a minimum of 20-25 hours per week. They do occasionally have full-time positions where 40 hours is possible. You are working for Sykes as an employee, not as an independent contractor. This also means you get benefits. Sykes offers benefits to both full and part-time workers who have been with the company for at least 30 days including medical, dental, vision, and after one year you can get 401K. Apparently the benefits for full-time workers are a lot better than the ones for part-time workers. The fact you get benefits here may help to slightly offset the low $9 to $10 an hour pay rate Sykes offers. First off, you should know that Sykes does a credit check on all applicants, but some black marks on your report are still OK. Many people on the work from home forums I browsed claim they were hired with less than perfect credit. The other important thing you should know is that Sykes also conducts a background check on you, and you are required to pay $45 so they can run it. However, you will NOT be asked to pay this money until after you've already been hired. It takes about one week for the background check. The first step in the application process is applying online. Sometime after you've done this, you may be invited to participate in a group interview. If that goes well, you might just get a job offer. Before you can start working, you'll have to go through training. The length of the training will depend on the client you're handling calls for. It could run for just a few days or last for several weeks. Fortunately, you do get paid for 100 percent of your training time with Sykes. Unfortunately, Sykes has a low score of 1.9 on Glassdoor when you filter by reviews that mention “work from home.” If you take out “work from home” from the filters, they score at 2.8. Some of the complaints we looked over included rushed training time, low call volume, and low pay (and at $9 to $10 an hour that certainly seems to be the case in our opinions, too). We also saw several people upset about being laid off when call volume was very low. People who praised the company appreciated getting to work from home, the benefits, and some thought management was great to work with. If you'd like to apply for a job at Sykes, you can go here to get started. Good luck! As always, I would appreciate any additional information you can share in the comments if you have it. Get my e-book with a fully-researched list of 150 work at home companies that are usually hiring along with step-by-step instructions for finding work at home job leads on your own. Invest in a subscription to FlexJobs, a company where I'm also a paying member. They list remote and flexible job leads five days per week, guaranteed scam-free. You can use promo code AFFILPROMO to get 30 percent off your membership. It's very easy to cancel if you don't like it. Check out our job leads page here at Real Ways to Earn! We post between 8-10 work at home job leads, five days per week. Hi. Do they provide you with Certificate of Employment in case needed? I am an international student in Canada and the embassy requires that I pass that document for the work experience to be counted if I want to apply for permanent residence. You are employed by Sykes and not an Independent contractor, right? can I use windows 10 if I work for them? Can you use Magic Jack or basic talk voip phones? or do they have capabiliites to know if you are hard wired or not? I have been waiting for my background to come back for over a month now, They say I’m not the only one. could someone help me understand why my background or any others hasn’t came back? i really need the job. i got hired by them recently, but i may not be able to use the landline i promised. does anyone know if i can get away with using my cellphone? I’m not sure i can afford landline service at the moment. I would suggest contacting them directly as I am not working for them as of yet… No, you can NOT use a cell phone or any other wireless unit; it MUST be a “CORDED PHONE” … I cannot represent them, but they are a GREAT company!!!! Wondering if anyone can answer this. I was offered $9 per hour during training than $25 per hour after training. Anyone can answer I would appreciate it before I move forward. I am trying to schedule an interview, I got an voice mail to go on-line an schedule an interview I need to find out how. I signed the paper for the background check 3 days ago… I am right on that border of the seven years they say they go back… I am worried about my felony also… Just wondering what happened with yours? You can have Windows 8 but not the upgrade to 8.1. 8.1 will not work with their systems. I got hired with a windows 8.1 computer. I asked them in the help window and they said it’s fine. Maybe ots just for certain positions. Mine is sales and billing. You could’ve went online and got a monitor for 60.00.
can anyone tell me if windows 8 will work for the sykes system? hard to find a computer right now that has windows 7 on it? It depends on the project that you will be working on. I have been working for this company a little over 3 months now. I love it! I was interviewed on valentines day, and couple weeks later started training. The interview process was incredible, one of the most professional and positive interview experiences I have had my entire life. I did not have to pay for a back ground check or send in money at all to get hired on, the only thing that might scare people is the need for the telephone headset, which at first I could only find them on sale for around $70, but after researching on ebay I purchased one for $25 (Platronics S12) and it works like a charm! I got a super cheap telephone (ConairPhone) at the thrift shop for literally $2 and that has been working this whole time. I would recommend this job to everyone I know and pretty much already have. The training is very thorough and lots of fun, you learn so much and you get to know everyone and form amazing friendships for an entire month! I can’t even express how awesome the coaches, team leads, mentors, and managers are at this company. They really care about you, the customers, and are excited to be there for the team. The culture is wonderful, you can always be yourself and they are very family oriented. My best advice is to set aside all your fears, be humble, and go for the job! Hello Kotts, Are you still working for Sykes? Do you know why they don’t accept satellite phones? Does it have anything to do with the flow of calls being forwarded to your phone? I can answer that. All of your equipment must be “hard wired”, your phone, headset, AND internet connection. You are working with customer accounts and sensitive information, so no wireless anything, including satellite. I have been with them for over a year, myself, and I can tell you that it’s an amazing work atmosphere. Even if you dislike the client you are working for, you can put in for a transfer. Your co-workers (team mates), team leads, trainers, everyone… cream of the crop. I was hired to work the retail client, A&F, for phone and emails. I started a two week training program in October. There were two trainers. The main trainer was another agent, which was strange. The assistant was a shift leader. A shift lead is basically one step up from an agent. They still work but are higher up and help out with questions, watch the call queue, etc. Our class had no -stop technical issues. We would go hours without doing anything at all. The material was poor and had major holes but you don’t realize it until you’re out in production and have to learn things you were never taught. The hours are few at best. You could have a week where you’re scheduled only 15 hours. The worst part is that you are often told to “jump off”. This means you are told to end your shift early and not be paid due to low call or email volume. You don’t have an option when they send a popup message to your virtual phone telling you to get off. If you don’t log off then they will kick you out of the phone and threaten to write you up for not following the rules. This program never has any hours, yet the company keeps hiring for the program. We all anticipate it is just to make sure Alpine is covered during the holiday season. Once it’s over, we will most likely have few hours like we do now. If low hours isn’t enough to add to your struggle to make a paycheck like most of us, then you will love the way you are paid. Alpine does not use a time keeping system to pay you. You are paid by your virtual soft phone which feeds to your payroll information section. Make sure you always back yourself up. If you have technical issues make sure someone knows about it. My team leader accused me of call avoidance because I was not receiving the popup messages to move to phones while I was working on emails. I’m not sure about other programs with Alpine Access, but with A&F you are only allowed 5 minutes of handle time on average. So each day your average handle time has to be 5 minutes or less. If you’re working emails you have to reply to 10 emails per hour. These numbers are often hard to reach because a call can be complex and go longer then expected. Each email you receive is different, so it can take longer to craft your reply. They have email responses you can use but yet if you use them you can get an automatic fail on your QA. Breaks? If you call 10 minutes a break then yes they have them. You are paid for those. They also give you a lunch break depending how many hours you work that day. It’s 30 minutes and is unpaid. If you do have technical issues with their system you have to request what is called “technical pay” and it has to be approved. So you could have an issue and they possibly may reject it and not pay you. Let’s talk benefits, if you call a discounted medical plan a benefit. The company also offers dental but there is a 6 month waiting period for basic and 12 months for major. So you have to wait 6 months before they will even cover a filling. Alpine claims to offer bonuses. After 30,000 hours you will get a $0.50 raise and a $1000 bonus check. Crazy right? If you think that’s tail spinning, well they will give you a $225 bonus for ever 450 hours you work within a 13 week period. This is called the Total Points program. All in all, Sykes Home Powered by Alpine Access comes across as a great company on the outside, but once you’re inside the ball of yarn begins to unravel. I am now looking for another job that offers decent benefits and that actually guarantees you a set amount of hours. I’ve talked a lot about the negatives. There are SOME positives like being able to pick up extra shifts that other agents post. You can also give away your shift and it will be taken within seconds to a few hours because of all the employees on each program needing or wanting more hours. I also like that direct deposit takes effect the very first pay cycle. There’s no need to receive a paper check. You are paid every two weeks on Friday at 12:00 am MST. You can make some great friends that last a life time and you can help each other out, which is always good to have. The program I am on gives a 40% employee discount on all merchandise. This is by far the best perk! There you have it folks! An in-depth review of Sykes Home. Make of it what you will, but I hope this information helps you out in some way. Your feedback is awesome i did recevied an invite for group interview however they want me to send the screenshots but i have MAC as of now. But i can buy windows once when they offer a job. Would that work can you please brief me whether they will select in this situation and is it must to send the screenshots prior to intreview. i notice they do a credit check. Does anyone know if anyone has been hired with bad credit. I was starting to apply until i saw the credit check & didn’t want to waste my time and $. As long as you don’t have too many negatives or charge offs they will hire you. Most of the clients do not require a credit quick. You will know in advance if the position you are applying to requires a credit check. Does anyone know if you apply to more than one position or do you just apply for one and they place with one most fitting to your qualifications? For instance they have financial reps, they have collection reps and the have insurance reps. Do I apply for all, or just one?